Mozambique, officially the Republic of Mozambique, is a country in southeastern Africa. Its capital is Maputo. There are about 19 million people. In 1975, Mozambique became independent from Portugal. (National Day on 25th June, 1975) The country was named Moçambique by the Portuguese after the Island of Mozambique which was the capital of Portuguese Africa. After independence from Portugal it became the People's Republic of Mozambique. There was a big civil war from 1977 to 1992. Mozambique has many natural resources. Portugal, Spain, and Belgium are among the country's most important partners. It is one of the poorest countries in the world. They have the world's lowest life expectancy. In 2012, large natural gas reserves were found in Mozambique. The revenues from the reserves might dramatically change the economy. The only official language of Mozambique is Portuguese. About half the people speak it as a second language and very few as a first language. Languages widely spoken natively include Swahili, Makhuwa, and Sena. The largest religion in Mozambique is Christianity. There are also Muslim and African traditional religious minorities. Mozambique is a member of the African Union, Commonwealth of Nations, the Community of Portuguese Language Countries, the Latin Union, Organisation of Islamic Cooperation and Southern African Development Community. At 309,475 sq mi (801,537 km2), Mozambique is the world's 35th-largest country. It is bordered by the Indian Ocean to the east, Tanzania to the north, Malawi and Zambia to the northwest, Zimbabwe to the west and Swaziland and South Africa to the southwest. The country is divided into two regions by the Zambezi River. To the north of the Zambezi River, the narrow coastline moves inland to hills and low plateaus. Further west are rugged highlands, which include the Niassa highlands, Namuli or Shire highlands, Angonia highlands, Tete highlands and the Makonde plateau, covered with miombo woodlands. To the south of the Zambezi River, the lowlands are broader with the Mashonaland plateau and Lebombo mountains in the deep south. The country has five main rivers and several smaller ones. The largest and most important is the Zambezi. The country has four notable lakes: Lake Niassa (or Malawi), Lake Chiuta, Lake Cahora Bassa and Lake Shirwa, all in the north. Mozambique has a tropical climate with two seasons. The wet season is from October to March and the dry season from April to September. Conditions vary depending on altitude. Rainfall is heavy along the coast and is less in the north and south. Yearly precipitation changes from 500 to 900 mm (19.7 to 35.4 in) depending on the region. Cyclones are common during the wet season. Average temperature ranges in Maputo are from 13 to 24 °C (55.4 to 75.2 °F) in July to 22 to 31 °C (71.6 to 87.8 °F) in February. This is a list of cities and towns with the most people. It is based on the most recent census done for each city or town. The entire country has about 22 million people. These 14 cities have 5 million total. This shows that most people still live in rural areas. Mozambique is divided into ten provinces (provincias) and one capital city (cidade capital) with provincial status. The provinces are divided into 129 districts (distritos). The districts are further divided in 405 "Postos Administrativos" (Administrative Posts) and then into Localidades (Localities), the lowest geographical level of the central state administration. Since 1998, 43 "Municípios" (Municipalities) have been created in Mozambique. The music of Mozambique can be for many purposes. These can be religious or for traditional ceremonies. Musical instruments are usually handmade. Some of the instruments used include drums made of wood and animal skin; the lupembe, a woodwind instrument made from animal horns or wood; and the marimba, which is a kind of xylophone native to Mozambique. The marimba is a popular instrument with the Chopi of the south central coast. They are famous for their musical skill and dance. The Makonde are renowned for their wood carving and elaborate masks that are commonly used in traditional dances. There are two different kinds of wood carvings. Shetani, (evil spirits), which are mostly carved in heavy ebony, tall, and elegantly curved with symbols and nonrepresentational faces. The Ujamaa are totem-type carvings which show lifelike faces of people and various figures. Theses sculptures are usually called “family trees” because they tell stories of many generations. During the last years of the colonial period, Mozambican art showed the oppression by the colonial power, and became a symbol of the resistance. After independence in 1975, the modern art came into a new phase. The two best known and most influential contemporary Mozambican artists are the painter Malangatana Ngwenya and the sculptor Alberto Chissano. Art during the 1980s and 1990s shows the political struggle, civil war, suffering, starvation and struggle. Dances are usually highly developed traditions throughout Mozambique. There are many different kinds of dances from tribe to tribe which are usually ritualistic in nature. The Chopi, for instance, act out battles dressed in animal skins. The men of Makua dress in colourful outfits and masks while dancing on stilts around the village for hours. Groups of women in the northern part of the country have a traditional dance called tufo, to celebrate Islamic holidays. Because the Portuguese were there for nearly 500 years, they greatly impacted the cuisine of Mozambique. Crops such as cassava (a starchy root) and cashew nuts (Mozambique was once the largest producer of these nuts), and pãozinho were brought in by the Portuguese. The use of spices and seasonings such as onions, bay leaves, garlic, fresh coriander, paprika, chili peppers, red sweet peppers, and wine were introduced by the Portuguese. So was sugarcane, maize, millet, rice, sorghum (a type of grass), and potatoes. Prego (steak roll), rissois (battered shrimp), espetada (kebab), pudim (pudding), and the popular inteiro com piripiri (whole chicken in piri-piri sauce) are all Portuguese dishes commonly eaten in present-day Mozambique. Football is the most popular sport in Mozambique. 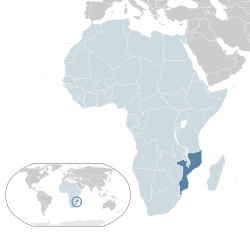 Wikimedia Commons has media related to Mozambique. ↑ Neto, Octávio Amorim; Lobo, Marina Costa (2010). Between Constitutional Diffusion and Local Politics: Semi-Presidentialism in Portuguese-Speaking Countries. Social Science Research Network. ↑ Shugart, Matthew Søberg (September 2005). "Semi-Presidential Systems: Dual Executive and Mixed Authority Patterns". Graduate School of International Relations and Pacific Studies (United States: University of California, San Diego). Archived from the original. Error: If you specify |archiveurl=, you must also specify |archivedate=. https://web.archive.org/web/20080819200307/http://dss.ucsd.edu/~mshugart/semi-presidentialism.pdf. Retrieved 20 August 2016. ↑ Shugart, Matthew Søberg (December 2005). "Semi-Presidential Systems: Dual Executive And Mixed Authority Patterns". Palgrave Macmillan 3 (3): 323–351. doi:10.1057/palgrave.fp.8200087. http://www.palgrave-journals.com/fp/journal/v3/n3/pdf/8200087a.pdf. "Of the contemporary cases, only four provide the assembly majority an unrestricted right to vote no confidence, and of these, only two allow the president unrestricted authority to appoint the prime minister. These two, Mozambique and Namibia, as well as the Weimar Republic, thus resemble most closely the structure of authority depicted in the right panel of Figure 3, whereby the dual accountability of the cabinet to both the president and the assembly is maximized.". ↑ 6.0 6.1 6.2 6.3 "Mozambique". International Monetary Fund. ↑ "2016 Human Development Report" (PDF). HDRO (Human Development Report Office) United Nations Development Programme. Retrieved 21 March 2017. ↑ Alexis Flynn (9 May 2012). "UPDATE: Mozambique Talks To Shell On Developing LNG". WSJ.com. Retrieved 10 May 2012. ↑ Fitzpatrick, Mary (2007). Mozambique. Lonely Planet. p. 33. ISBN 1-74059-188-7. This page was last changed on 18 January 2018, at 22:07.